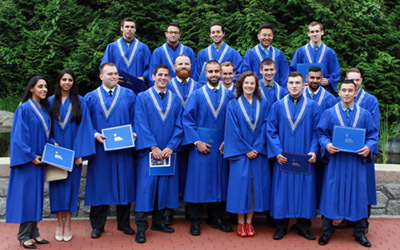 Students in the first cohort of the Bachelor of Law Enforcement Studies were among the graduates recognized at the 2016 JIBC Spring Convocation on June 9, 2016 at the New Westminster Campus. Justice Institute of British Columbia (JIBC) celebrated the academic accomplishments of its graduates at the Spring Convocation held on June 9, 2016 at the New Westminster Campus. Nearly 300 graduates from 27 different academic programs across JIBC’s three Schools were recognized, including students in the first cohort of JIBC’s Bachelor of Law Enforcement Studies program, many of whom are progressing into their chosen professional fields in justice and public safety. Cathy Knapp, the student speaker at the 2016 JIBC Spring Convocation shares the personal and professional significance of graduating from JIBC. 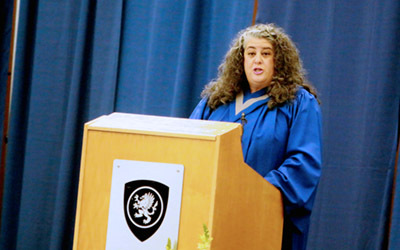 Among the students graduating was Cathy Knapp, who completed JIBC’s Conflict Resolution: Mediation/Third Party Intervention Certificate and was the student speaker at Convocation. In her remarks, Cathy noted a few of the reasons why graduating at JIBC was an important accomplishment in her life. In addition to serving as an academic milestone, completing her certificate program as a mature student was a way for her to serve as a role model to her daughter by illustrating the value that comes with completing a post-secondary education. The applied nature of her JIBC education also serves as a strong foundation as she embarks on a new career after retiring as a human resource manager for a major airline.